When placed in a common space, such as the kitchen, all family members are able to pass by the calendar and be reminded of upcoming events. Your family can use the calendar to schedule family meetings and family outings, and to track family goals. The calendar also allows parents and children to schedule their own important events—like parent date night or friend play-dates. In addition, a Family Calendar can help teach children about organization, cooperation, advance planning, and communication. Children also learn that their plans and wishes matter. A Family Calendar should be big enough to include the entire family’s schedule. The best option is a big desk calendar from an office store. 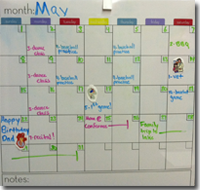 Stickers and markers can be used to highlight special events like birthdays, holidays, homecomings, and other important family dates. Making a Family Calendar is just one fun activity that can help children feel at ease during a transition time.